I have been using Books of the Bible At-a-Glance from Teach Sunday School in my Bible studies this year. We were provided with an advance reader copy for review purposes as part of the Homeschool Review Crew. All opinions are our own. When you do a Bible study, where do you turn for the context and timeline? I’ve found that many different Bible studies for kids and even adults fail to provide a good overview of the book being studied. That lack of reference is what had me intrigued to check out the Books of the Bible At-a-Glance. 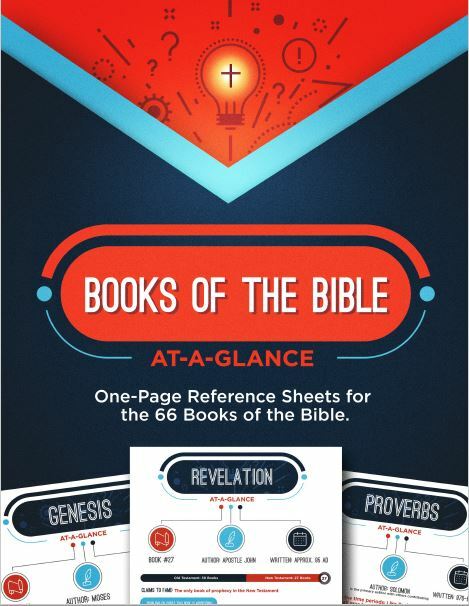 Each page provides an at-a-glance section with placement in the Bible, who authored (or is believed to have authored the book) and when it was written. The page then continues with the time period of the book and a graphic showing placement in the Bible. The claims to fame section shows the most famous stories in the book as well as some of the more well-known verses. Finally, the page shows a quick summary (breakdown) of the book. This is considered a reference which can be used any way that you can dream up. So far, I have read through many of the pages to get my mind in place before reading the same Book of the Bible. I can easily envision doing this approach with my older boys. You can read the summary page and then read the book. The individual pages are written in such a manner that my 3rd grader can also read and understand. The other way I am trying to use this resource is to give me the overview of a particular book before using a child’s study with my youngest son. He does like to ask me questions that fit with the need for placement (what happened before or after) and this is a great way for me to prep. Plus, the study he has been using bounces between Old and New Testament as the year progresses. If you are looking for an easy to use overview of the Bible, this may be a great addition to your home. What resources do you use with your family to study the Bible? Would the Books of the Bible printables be a good addition to your resources? Don’t just take my word for how we found this to be. Visit the Teach Sunday School post on the Homeschool Review Crew website to see what other homeschooling parents thought about this resource.